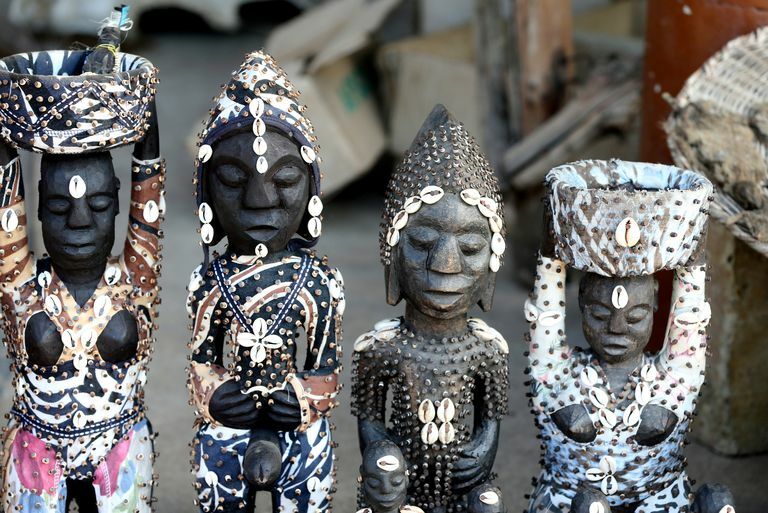 However, as with any religion, followers of Vodou cannot be lumped into a single category. There are also many misconceptions, which are just as important to understand. Vodou is also known as Vodoun, Voodoo, and by several other variants. It is a syncretic religion that combines Roman Catholicism and native African religion, particularly from the religion of the Dahomey region of West Africa (the modern day nation of Benin). Vodou is primarily practiced in Haiti, New Orleans, and other locations within the Caribbean. Vodou began when African slaves brought their native traditions with them as they were forcefully transported to the new world. However, they were generally forbidden from practicing their religion. To get around these restrictions, the slaves started to equate their gods with Catholic saints. They also performed their rituals using the items and imagery of the Catholic Church. If a Vodou practitioner considers himself Christian, he generally professes to be a Catholic Christian. Many Vodou practitioners also consider themselves Catholics. Some see the saints and spirits to be one and the same. Others still hold that the Catholic accouterments are primarily for appearance. Popular culture has strongly associated Vodou with devil worship, torture, cannibalism, and malevolent magical workings. This is largely the product of Hollywood coupled with historical misrepresentations and misunderstandings of the faith. The seeds of these misconceptions began much earlier than anything seen in the movies. A well-known incident in 1791 at Bois Caiman marked a crucial time in Haitian slave uprisings. The exact details and intent are a matter of historical debate. It's believed that witnesses saw a Vodou ceremony and thought the participants were making some sort of pact with the Devil to thwart their captors. Some people -- even as recent as 2010 after the devastating earthquake -- have claimed that this pact has perpetually cursed the Haitian people. In the Vodou-influenced areas such as Haiti, slavery was extremely violent and brutal; the revolts of the slaves were equally as violent. All of this led white settlers to associate the religion with violence and also helped fuel many unfounded rumors about Vodouisants. Vodou is a monotheistic religion. Followers of Vodou -- known as Vodouisants -- believe in a single, supreme godhead that can be equated with the Catholic God. This deity is known as Bondye, "the good god". Vodouisants also accept the existence of lesser beings, which they call loa or lwa. These are more intimately involved in day-to-day life than Bondye, who is a remote figure. The lwa are divided into three families: Rada, Petro, and Ghede. The relationship between humans and lwa is a reciprocal one. Believers provide food and other items that appeal to the lwa in exchange for their assistance. The lwa are frequently invited to possess a believer during ritual so the community can directly interact with them. Vilokan is the home of the lwa as well as the deceased. It is commonly described as a submerged and forested island. It is guarded by the lwa Legba, who must be appeased before practitioners can speak to any other Vilokan resident. There is no standardized dogma within Vodou. Two temples within the same city might teach different mythologies and appeal to the lwa in different ways. As such, the information provided in overviews of Vodou (such as this one) cannot always reflect the beliefs of all believers. For example, sometimes lwa are associated with different families, Catholic saints, or veves. Some common variations are included here. Animal Sacrifice A variety of animals might be killed during a Vodou ritual, depending upon the lwa being addressed. It provides spiritual sustenance for the lwa, while the flesh of the animal is then cooked and eaten by participants. Veves Rituals commonly involve the drawing of certain symbols known as veves with cornmeal or another powder. Each lwa has its own symbol and some have multiple symbols associated with them. Voodoo Dolls The common perception of Vodouisants poking pins into Voodoo dolls does not reflect traditional Vodou. However, Vodouisants do dedicate dolls to particular lwa and use them to attract a lwa's influence.